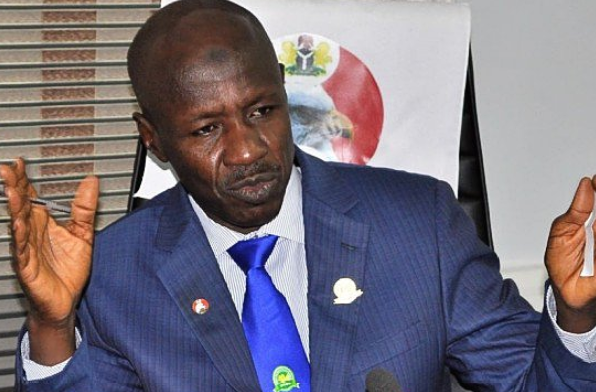 Ibrahim Magu, acting chairman of the Economic and Financial Crimes Commission (EFCC), has spoken on the challenges of the commission in arresting Diezani Alison-Madueke, former minister of petroleum resources. Reacting to the court order that the EFCC and other security agencies should produce Alison-Madueke with 72 hours, Magu said it would have been an easy task if she was not outside Nigeria. On Monday, the court had granted EFCC leave to arraign Madueke who is standing trial alongside Jide Omokore, a former chairman of Atlantic Energy Drilling Company, on five counts bordering on conspiracy and illegal act of accepting and giving gratifications. Speaking during an interactive session with journalists on Wednesday in Abuja, Magu said the anti-graft agency is not in the habit of not complying with court orders but in the case of Alison-Madueke, “our problem is that she is another man’s country”. “I need less than 72 hours to produce Deziani. How can I get her if she is being protected by forces outside this country?” he asked. He said the fact that the suspect is being prosecuted by other law enforcement agencies outside this country, is a “predicament” to the EFCC. He, however, said another agency was working on extraditing Alison-Madueke. “We will comply with the court order. In fact, it is in our character to do so. If we won’t comply with the court order, that means we have reasons to appeal against the court decision,” Magu said. “Another law enforcement agency is in the matter. You know she is in the United Kingdom. And we are making preparations to get her. We have already gone to the court, in fact that was our request for extradition that compelled the court to issue a warrant of arrest against her. “I need just less than an hour. If she is here, I will get her immediately and take her before the court. Our problem is that she is another man’s country.